I have never been able to eat very spicy or really hot food. I learned to adapt over the years to be able to eat food that many considered bland to food that has a little heat to it. Peppers are one of the main ingredients to provide that heat. Peppers can be the spice of life. The Scoville scale is a measurement of the pungency (spicy heat) of chili peppers, such as the jalapeño, the bhut jolokia, and the world’s current hottest pepper—the Carolina Reaper, or other spicy foods as reported in Scoville heat units (SHU), a function of capsaicin concentration. Capsaicin is one of many related chemicals, collectively called capsaicinoids. The scale is named after its creator, American pharmacist Wilbur Scoville. His method, devised in 1912, is known as the Scoville Organoleptic Test. 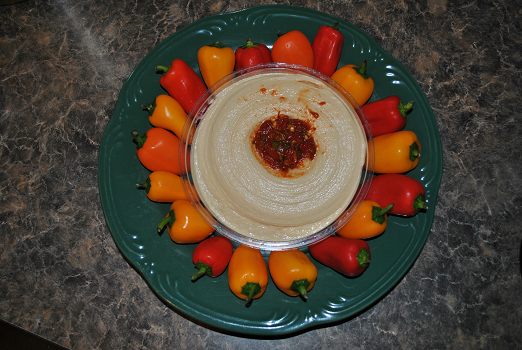 Peppers are grown for many uses, such as salsa, as ingredients to other meals and even ornamental. 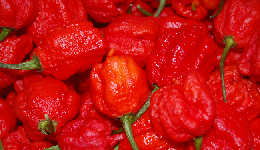 One of the hottest peppers is called the Carolina Reaper which has a 1.57 million SHU to 2.2 million SHU. Not one I could put in my mouth and chew. It seems as though there is a great deal of pride taken in having the hottest pepper. The best mild pepper plants that are suitable for salsa include Bermuda hot peppers and poblano peppers. Bermuda hot peppers average 6.5 centimeters long and approximately 3 centimeters in diameter. The plant produces white flowers on thick, green foliage and green stems that grow to a maximum height of 60 centimeters. They rank between 500 and 2,000 SHU. Native Mexican poblano peppers grow to a length of approximately 15 centimeters and a width of 8 centimeters. They are mildly hot and mature to a bright red color when ripe. Poblano peppers are ideal for frying, roasting and stuffing and rank between 500 and 2,500 SHU. Medium pepper plants are slightly hotter than mild pepper plants and are ideal for infusing a little zest in salsa. The best medium pepper plants include jalapeno peppers and rocotillo peppers. Jalapeno peppers, when ripened, grow to between 5 and 9 centimeters in length. Good quality peppers are green, smooth-skinned and have dry lines indicating hotness. Jalapeno peppers rank between 3,000 and 6,000 SHU. Bell-shaped rocotillo peppers are yellow or green when unripe and brown, orange or red when ripe. They are typically around 2.5 centimeters wide and 2.5 centimeters long. Rocotillo peppers rank between 1,500 and 2,500 SHU. The best hot peppers for salsa include Serrano peppers, Tabasco peppers and cayenne peppers. Serrano peppers are biting hot and do not need to be peeled or steamed before using, making them easy to add to salsas. Peppers reach 10 centimeters long, and turn orange, red or brown from a bright green when mature. Serrano peppers are between 10,000 and 20,000 SHUs. Tabascos, best known for their use in Tabasco sauce, are fiery, tapered peppers that rate between 30,000 to 50,000 on the Scoville scale of heat. Their most unusual feature is that the peppers grow upward, sticking their yellow and red heads out of thick foliage when mature. And then there are the ornamental pepper plants, which one of the coolest has to be the NuMex Twilight which was developed by New Mexico State University. The peppers start out white, then purple and turn shades from orange to yellow as they develop. “Ornamental pepper care is easy, and you can expect fruit from mid spring until fall. Bushy, glossy green foliage and colorful fruit that stand in upright clusters at the end of the stems combine to create an outstanding ornamental plant. The fruit comes in shades of red, purple, yellow, orange, black or white, and the peppers change colors as they ripen, so you may see several different colors on the same plant. Use them as bedding plants in the garden or plant them in pots so you can enjoy them on sunny decks and patios. in USDA growing zones 9b through 11, they are usually grown as annuals. They can also be grown indoors and make attractive houseplants. Are Ornamental Peppers Edible? Ornamental peppers are safe to eat, but they are normally grown for their attractive color and ornamental qualities rather than their flavor, which you may find disappointing. Most people consider them too hot to enjoy anyway. Peppers bred for culinary use produces better fruit for eating. Begin feeding the seedlings with half-strength liquid fertilizer at two week intervals about three weeks after they germinate if you have planted them in seed starting medium. The medium manages water well and helps prevent fungal diseases such as damping off, but it doesn’t contain nutrients the plant needs to grow. Good potting soils contain enough nutrients to support the plant until transplanting time. Transplant the seedlings into a sunny part of the garden with organically rich, well-drained soil. Space the plants according to the directions on the seed packet or plant tag, or about 12 inches apart. If you prefer to grow your ornamental peppers in containers, use 6- to 8-inch pots filled with good quality general purpose potting soil. Ornamental Pepper Care Ornamental peppers require little care. Water the plants when there is less than an inch of rain in a week. Side dress with general purpose fertilizer when the first fruits appear and again about six weeks later. If you are not bold enough to eat the hot spicy varieties of peppers, there are the old standby bell peppers that can be used in cooking or cut up for dipping. Any way you look at it, there is a pepper for you, it may be to look at and enjoy such as the ornamental varieties or the ones that you eat and flames shoot out. Pick a variety or two and enjoy your red hot chili peppers. Take the stems off the peppers and throw away the stems. Place the peppers and seeds in the blender. Blend well. Next toss in the stewed tomatoes with juice, 1 jalapeno (sliced), 1/2 yellow onion (quartered), 1 garlic clove, handful of cilantro, lemon juice, salt and pepper and blend till you have the consistency desired. I don’t like my salsa chunky, that’s what Pico De Gallo is! I also don’t want it too runny so it runs off your chips, so I just “pulse” it a few times. If you feel the salsa looks too white from the onion this just means you need to add more cilantro to your salsa. Try the salsa with your chips and adjust the seasonings as needed. Bibliography:“The Pepper Lover’s Site for Spice – Cayenne Diane.” Cayenne Diane. N.p., n.d. Web. 10 May 2016.Gilani, Natasha. “The Best Pepper Plants for Salsa.” EHow. Demand Media, n.d. Web. 10 May 2016.”NuMex Twilight.” Wikipedia. Wikimedia Foundation, n.d. Web. 10 May 2016.”How to Select the Best Pepper Plants for Salsa.” GardenGuides. N.p., n.d. Web. 10 May 2016. “Carolina Reaper.” Wikipedia. Wikimedia Foundation, n.d. Web. 10 May 2016. “Scoville Scale.” Wikipedia. Wikimedia Foundation, n.d. Web. 10 May 2016. The Atlantic. Atlantic Media Company, n.d. Web. 10 May 2016. “Cayenne Diane’s Big List of Hot Peppers.” Cayenne Diane. N.p., n.d. Web. 10 May 2016. “Ornamental Pepper Plants.” Best. N.p., n.d. Web. 10 May 2016. “Ornamental Pepper Planting – Tips For Growing Ornamental Peppers.”Gardening Know How. N.p., 30 July 2012. Web. 10 May 2016. Saddlingup_nicole. “Authentic Mexican Salsa Recipe – Food.com.” Authentic Mexican Salsa Recipe – Food.com. N.p., n.d. Web. 10 May 2016.